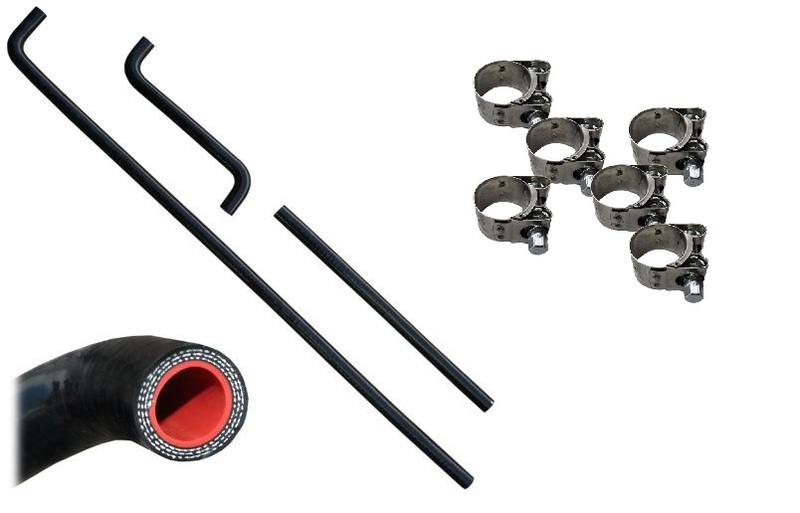 New OE Style Silicone Heater Hose and T-Bolt Clamp Kit for 1966 to 1977 Ford Broncos. This kit is molded just like the factory original heater hoses to make installation quick and easy. Silicone hoses last longer and are more restistant to extreme temperature changes than traditional rubber hoses. This hose kit is made exclusively for Tom's Bronco Parts and is the ONLY kit that has the factory style curvature molded in. The included clamp kit includes 6 t-bolt style clamps to fit your silicone heater hoses. These clamps feature stainless steel clamps and zinc-coated t-bolts. These clamps are specifically designed to hold your heater hoses securely without digging into the material like traditional worm gear clamps. These clamps also look much nicer in the engine bay than traditional clamps.